After it extracts I already I had the image of this wallpaper in my head. It was accurately this, except the title that I made in the last hour. I loved this image of the Rukia, I found perfect. It is different of whom to find of it, therefore I decided to make wall with it. I wait that they like. This and other works mine you can find in http://www.daisuki.com.br . Anoca wallies here too XD! I just luv this one with that melancholic mood ^^! Aw ! It is really awesome. Yes it's simple, peaceful and so sad. The atmosphere is sublime. Woah! Diz is soooo cool! 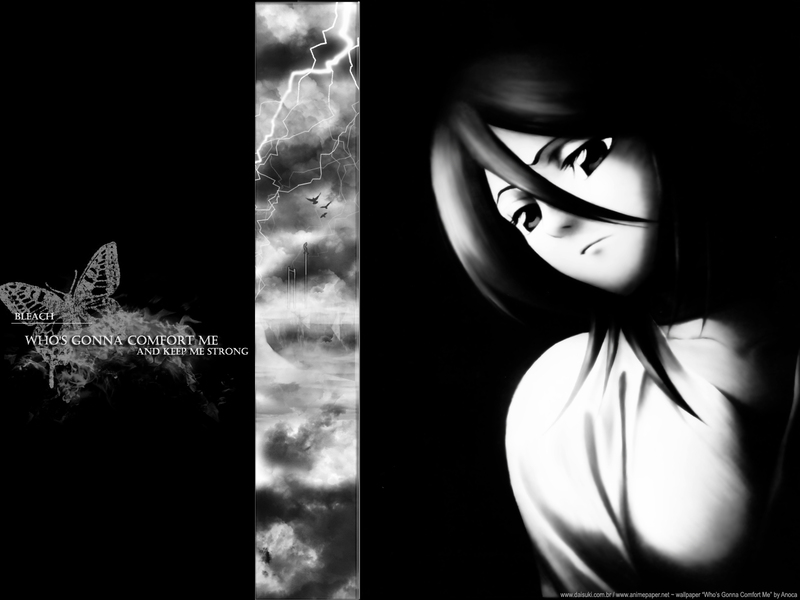 Rukia looks sooo cool in ere! Thnx sooo much 4 uploadin it! love this episode! tthanks 4 the wall! Yea... gotta work more on the text font and color. The text is hard to see and differentiate since your background is too busy and crowded. There is also the problem of the color used for it; a red font over a red background isn't gonna work. Background picture looks fine. Maybe a little bit of depth of field would be a nice. Lovely and sad! Great work! Thank you for sharing!